← Creativity: Should the ‘mediocre middle’ be kept inside the box? Were the 1970s really that bad? The Seventies were crap. It’s one of those things that ‘everybody knows’. The unions held the country to ransom, refuse piled up in the streets, power cuts were frequent and the fashions were embarrassing. The economy was tanking and Britain was going down the tubes. It was the rubbish decade between the Swinging Sixties and the Go-Getting Eighties. I’ve never felt that this was entirely fair. OK, I was a kid at the time and my memories of the 1970s feature long summer days and Space Hoppers, not strikes and rising prices. But the adults enjoyed themselves too. My parents and their friends talked a lot about the grim economic situation while running two cars, going on foreign holidays and having parties, most of which would not have been affordable to people in similar jobs a decade earlier. At least, that’s how I remember it. The strange thing about the 1970s is that although many people vividly remember the power cuts, strikes and shocking headlines, they often have surprisingly affectionate personal memories of the decade that taste forgot. It has become a cliche to look back through rose-tinted glasses at the world of Bagpuss, space hoppers and Curly Wurlies – all of which, I should admit, dominate my memories of the decade, because I was born in 1974. But in a funny way, those things actually work very well as symbols of the decade, because what they represent is the reality of everyday affluence. The fact that so many children had space hoppers, ludicrous as it may seem, is testament to the fact that even working-class families now had a solid disposable income and could afford toys for their younger members. Even Star Wars, which first went on general release in Britain in early 1978, would never have become such a phenomenon had not so many children had the pocket money for all those Palitoy figures. The truth is that behind all those terrible economic and political headlines, most ordinary families in 1970s Britain were better off than ever. While people shook their heads sorrowfully over the breakfast table, digesting the news of some new IRA bombing or absurdly petty British Leyland strike, their surroundings often told a rather more optimistic story. The lurid furnishings of their new suburban homes, the swanky hostess trolley in the kitchen, the bottles of Blue Nun and Black Tower cooling in the fridge, the brand new colour television in the lounge, the turmeric-coloured Rover SD1 in the drive, even their teenage children’s painfully tight flared trousers – all of those things, which are so easy to satirise today, reflected the realities of a brave new world, forged in the crucible of mass abundance. The economic data bear this out. Although the mid 1970s recession marked the end of the postwar boom, the economy soon picked up. The slump was no worse than those of the 80s and 90s, and nowhere near as bad as the current one. Real GDP grew during the decade. Even with the downturn in the middle of the decade, GDP grew by around 2.5 percent per year from 1970 to 1979. The way things are going the 2010s will struggle to match that. Source: ONS via Guardian Data Blog. Given the rampant inflation, household incomes held up pretty well too. Despite a dip in the mid-1970s, incomes grew in real terms by around 2.8 percent per year across the decade. Income was more evenly distributed in the 1970s than in any decade before or since. 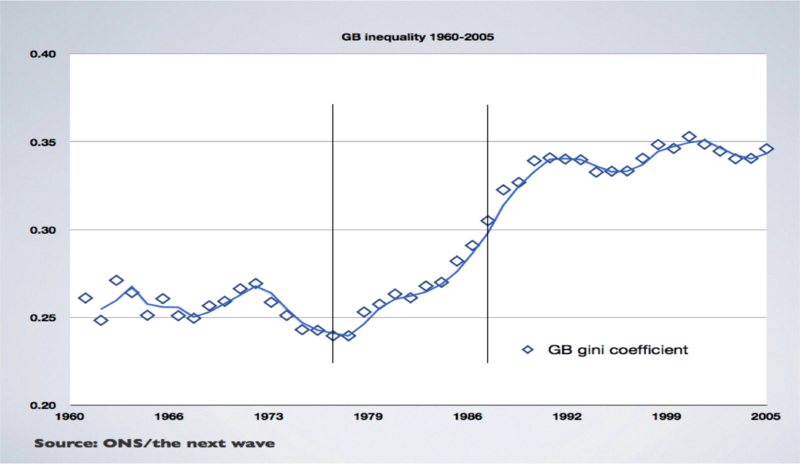 As Aberdeen University’s John Bone notes, the UK’s Gini Coefficient (a measure of inequality) was at its lowest between 1970 and 1979. In terms of income, at least, Britons have never been more equal than they were in the Seventies. This new affluence enabled working-class people out to go out and play in a way they never had before. Stuff Butlins, we’re all off to sunny Spain. Customise the car and shove in a CB radio. For most people, the Swinging Sixties didn’t arrive until the early Seventies. Until then, hedonistic cutting-edge fashion had been the preserve of the few. In the 1970s, it was opened up to all. Although we laugh at Seventies fashions now, or ape them in an ironic way, the crazy dress-sense of the decade reflected the spirit of the times. Not since the days of the Regency Fops had men worn bright colours and high heels. Miners and steelworkers walked out on Friday nights in outfits that would have provoked streams of homophobic abuse only five years earlier. Come to think of it, outfits like that would provoke steams of homophobic abuse now. Those of us who were into punk in the late Seventies liked to think we were breaking with the past and rejecting the music and fashions of older brothers and sisters. In fact, punk was very 1970s. In terms of fashion, it was an outrageous decade. Punk was just a different sort of outrageous. It was a time for pushing boundaries. As Kurt Andersen argued in Vanity Fair earlier this year, fashion is a lot more conservative now. Of course, some things about the 1970s were grim. The casual racism and sexism seem shocking when viewed from 2012. Being gay, outside a few liberal enclaves in major cities, could be extremely dangerous. But that was true in the adjoining decades too. In Northern Ireland, perhaps, the Seventies were worse than the Sixties and Eighties. In the rest of Britain, though, compared with other decades they don’t look too bad. 11 Responses to Were the 1970s really that bad? Until I read recent articles about it, I hadn’t even realised the 70s were considered bad. I went to university, on full grant (no tuition fees & living expeses as a grant instead of a loan) and graduated in 1975. I was working within six weeks of leaving and was able to turn down other offers. I was able to afford rent to share a house in outer London, and by 1978 was living in a very nice shared flat in Swiss Cottage. I could walk to the zoo, Primrose Hill and Hampstead Heath. In 1979 I married and we bought a house in East london. We could afford to pay the mortgage without too much stress.Fares in London, especially on the Underground were extremely reasonable and hardly anyone near to the transport links bought a car because it would have been pointless. There were times when we had 3 day weeks and power cuts, but as I remember we just got on with it. The worst part was that the music in the second half of the seventies was a bit rubbish, but we had Bowie, Roxy Music and later on Punk and early New Romantics. Overall the worst thing about the 70s was Thatcher being elected in 1979. That was the beginning of the greedy, selfish approach to life that is blossoming so much now. If the only thing that was bad about the 70s was that big business was making smaller profits, that is fine by me. I endorse LittleMavis’s comments. Chris Dillow also makes a very good point: The 1970s were bad for bosses but good for ordinary people. Of course the rich howled when Dennis Healy squeezed the buggers until the pips squeaked. More of the same please! Rick, this is one time when we must disagree! I’m exactly the age profile of those who started ‘married life’ in the early 70s (’68, actually!) and, frankly, I don’t feel that that time was good it all…. We were living Up North in the mid-70s and raising a family when housing was desperately scarce, mortgage rates were 18% and there was a three-day week. And that’s before we mention that only a tiny handful of young people at the beginning of that decade – esp women, around 5%? – got anywhere near a decent degree course or a full professional qualification. There might have been full college ‘grants’, but they were only for a probably smaller proportion of the youth population than now receives scholarships or whatever. In ‘those days’ (!) you had to earn your scholarship, often as a trepidatious first-generation entrant, by actually winning a degree place at all. Most really didn’t manage it. I’d resist very actively the idea that things were easier or simpler. They weren’t: almost no domestic modcons of the sort we know today; seriously much less gender (or other ‘minority’) equality; the continuing tyranny of the 11+ as a way of pronouncing most children ‘failures’; no child care; grimy cities (smog…); pathetic infrastructure, much less knowledge of medical care; really unpleasant bullying at work the routine experience of women attempting to build professionals lives… Need I go on? Good to know people a decade younger enjoyed their time then, but those ‘ordinary people’ who were not quite so fancy-free found simple survival often quite difficult (just as some do now). But on one thing I would very certainly agree with other commentators here: the arrival of the Thatcher era portended an even greyer, grimmer decade to come. I just desperately hope we’re not in for another lot of that now. Britain in the 1970s……always cold. Blokes wearing donkey jackets and nasty mustaches and sideburns standing around a flaming brazier while hideous British made cars trundled by. The IRA and youths in Ireland hurling rocks while wearing lumberjack style short fur trimmed jackets and flared tight jeans. And the bloody hair styles! Jesus Christ, what kind of hell was that. Well that was the view from Australia. Now I live here and I love it most of the time! Although the 1980s were a bit shite too. You were subject to propaganda. I lived through it. So I can testify it’s fact not propaganda. Strikes, secondary picketing and violence happened way to often. But the worse thing was definitely the hair styles. Rampant endemic Sexism, racism, class constraint, homophobia, smoking everywhere, cultural censorship via three TV channels, no internet, no eBooks; drab restaurants, no variety of food, no cheap travel, The Establishment keeping everyone down, casual domestic violence, no financial freedom for women via careers, Union bullies controlling the economy, crap medical technology, inefficient cars, planes and trains. Yep. Thank God they’re long gone. Landcruiser and Jaynator: Indeed, indeed. My whole recollection of the ’70s – I was a young woman, a graduate married with a small child, living in the North of England – is one grey mist of worry and feeling hemmed in on every side by forces I then barely understood. I didn’t, for instance, get to go out of the UK for a whole two decades around that time (no money), though that was absolutely the least of my concerns. Not nice, at all. Some rose tinted socialist glasses here. A little research shows that Dennis Healy and Labour bankrupted the country in 1976 and had to get a financial bailout from the IMF. His high tax policies left everyone worse off. And don’t forget the rampant bully boy unions that helped destroy the car industry and earned us the nickname ‘ the sick man of europe’. then there was labour’s ‘winter of discontent’. Thanks to the strikes you couldn’t get petrol, many schools and hospitals had to close, the dead couldn’t be buried and mountains of rubbish were stacked in the streets. Whatever you think of her, the Thatcher goverment turned things round for the better. But some of the music was good and at least house prices were affordable.